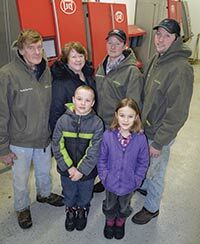 The Boettchers installed four robots on their 230-cow farm near Wykoff, Minn. Pictured (back row, from left) Curtis, Cheryle, Brian and Chad; (front) Curtis and Cheryle’s grandchildren, William and Kayla Arndorfer. A recent Dairy Star article, Keeping variety in their routine, features producers Curtis and Cheryle Boettcher. The Boettchers currently milk 230 cows, near Wykoff, Minn., with the help of their two sons, Brian and Chad, the occasional help of their daughter, Nichole Arndorfer, and four Lely Astronaut’s. They knew robots would allow them to stay the same size and reduce the amount of employees needed. After visiting one farm and doing some research online, they decided on an automated milking system. "It was a fairly quick process," Brian said about deciding on robots. "Everybody was impressed with the robots," Chad said. Construction to add the robots onto their freestall barn began in October 2012. By April 2013, the first cows were going through the four robots. Since beginning to use the system in April, it has freed up more time for the Boettchers to do other things on the farm. Robots also provide more information about the cows, including when cows are in heat, rumination and production, along with other data. Production of the herd has improved nearly 15 pounds per cow per day. The cows adjusted to the robots very quickly, the Boettchers said. For the first 10 days of using the roots, Lely sent dairy farmers who have robots on their dairy from all over the country to the Boettchers' farm to help with the transition. To read more about the Boettcher's dairy operation and their experience with robotic milking, read the full article here. Visit our website, at www.lely.com/en, for more information on robotic milking or our YouTube Channel, at www.youtube.com/lelydairylife, to hear from other producers currently Living Life Lely.